Mill-Max Mfg. Corp. expands its line of relay and oscillator sockets by introducing six new series with unique patterns, bringing our total to ten. Relay sockets accept devices with I/O pins on .100" grid. They make device field insertion and removal easy and convenient. Assembled with precision screw machine receptacles and packaged in high temperature thermoplastic insulators, Mill-Max relay sockets can be exposed to reflow temperatures. 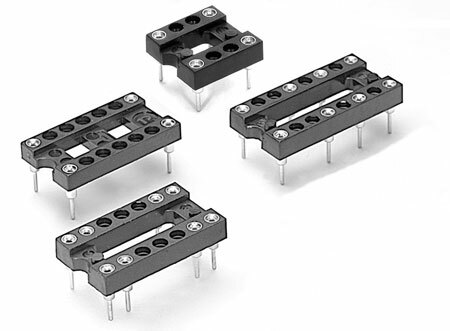 New series 110…10-00X (X = 2-5) relay sockets are available in 4, 6, 8, 14 and 16 pin configurations. Mill-Max relay sockets use MM#1001 receptacles assembled with a hi-rel, 4 finger #30 contact rated at 3 amps.